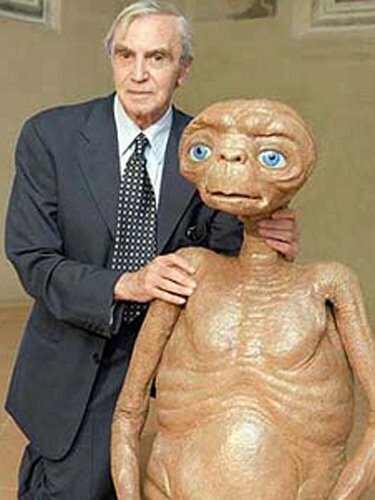 Carlo Rambaldi, the renowned Italian special effects artist who created E.T. the Extra Terrestrial, has died aged 86 after a long illness. Carlo Rambaldi worked with many Italian directors including Pier Paolo Pasolini and Dario Argento but he became world famous for his work in Hollywood. As well as Steven Spielberg’s ET, carlo Rambaldi worked on Ridley Scott’s 1979 film Alien and John Guillermin’s King Kong in 1976. He was awarded Oscars for all three. Carlo Rambaldi died in hospital in the city of Lamezia Terme, in Italy’s Calabria region. He was born in Vigarano Mainarda, near Ferrara in north-east Italy, and attended Bologna’s Fine Arts academy. His introduction to cinema came in 1956 when he was asked to create a 16 m (52 ft) dragon for a low-budget science fiction film. Carlo Rambaldi moved to Rome where his work drew the attention of producer Dino De Laurentiis, who brought him to Hollywood to work on King Kong. Once in the US he became a master in the art of mechatronics – a mix of mechanical and electronic engineering used to produce special effects. Italian director Pupi Avati described him as “a child who loved to play and make his toys”.